96 - 00 HONDA CIVIC / DEL SOL. 1.6L (1590cc) SOHC L4 16V W/ VTEC, "D16Y5 D16Y7 D16Y8 D16B5". 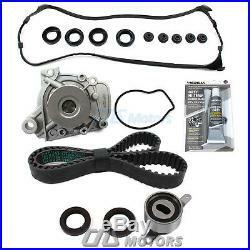 Brand New Timing Belt Water Pump Kit & Valve Cover Gasket. 96 - 96 - 00. CIVIC CX DX LX 1.6L SOHC L4 16V, ENG. CIVIC EX VTEC 1.6L SOHC L4 16V, ENG. CIVIC HX VTEC 1.6L SOHC L4 16V, ENG. CIVIC GX 1.6L SOHC L4 16V, ENG. CIVIC DEL SOL S 1.6L SOHC L4 16V, ENG. CIVIC DEL SOL Si VTEC 1.6L SOHC L4 16V, ENG. 1 Timing Belt (104 Round Teeth). 1 Timing Belt Tensioner (Bearing Assembly). 1 Crankshaft Front Oil Seal. 4 Spark Plug Tube Seals. 1 Water Pump & Seal. 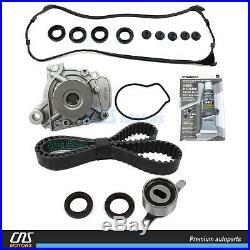 The item "Timing Belt Kit Water Pump Valve Cover Gasket for 96-00 Honda Civic Del Sol 1.6L" is in sale since Thursday, June 13, 2013. This item is in the category "eBay Motors\Parts & Accessories\Car & Truck Parts\Engines & Components\Other". The seller is "cnsmotors" and is located in South El Monte, California. This item can be shipped worldwide.